You will be amazed by the ultra-soft hand and performance of this exclusive fabric. 60% combed ring-spun cotton/40% polyester 30 singles 4 ounce lightweight jersey. Side seamed with curved bottom. 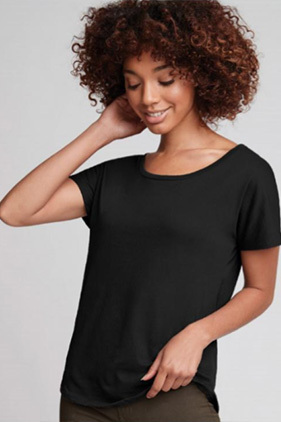 Dolman cut has a flowy fit that is flattering for all. Set-in Collar 1x1 baby rib. Side seamed. Curved hem. Tear away label.